Missing Person: John McConey, 69, BM, 5'6", 150 lbs. Last seen: 3/7/15, Langley Pl, New Brunswick. John McConey, 69, black male, 5'06", 150 pounds, green eyes, grey hair, and a scar on his chest from recent heart surgery. Mr. McConey was last seen on March 7, 2015 on Langley Place, New Brunswick, N.J., after he went for a walk. 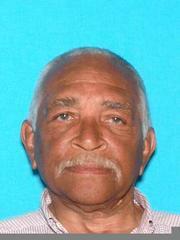 He is known to frequent the area of Hamilton Street in Somerset, N.J., and he walks with a cane. Mr. McConey has medical conditions, and he left without his medications. Anyone with information that can assist in helping safely locate John McConey, is asked to contact the New Jersey State Police Missing Persons Unit at (609) 882-2000 ext. 2893 or the New Brunswick Police Department at (732) 745-5200.